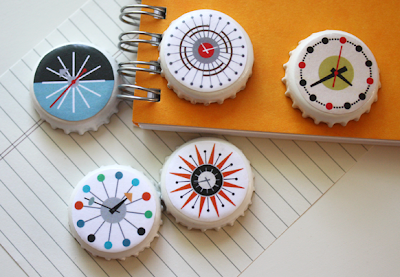 I finally did something with the used bottle caps accumulating in a cup in our kitchen: DIY mid century modern clock magnets. 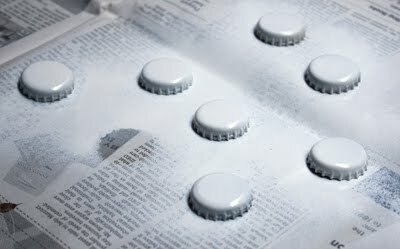 Wash and dry the caps, then spray paint them white. Let dry. Download the clock graphics I made, print, and cut them out. 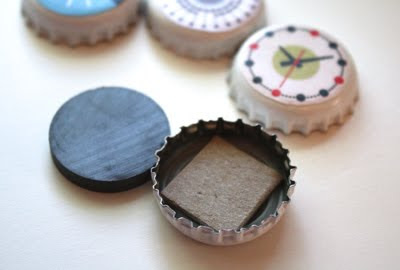 Brush the surfaces of the bottle caps with a bit of Mod Podge or other glue, stick on the clock faces, and brush another coat of Podge over the top. Let dry. Glue magnets to the back. I used E6000 glue for this, and the magnets are 1-inch disc magnets from a local hobby store. They weren't quite thick enough to fill the bottle cap, so I added a small piece of cardboard as "filler" to make the magnetic surface level with the edge of the cap. Done! These are soooo fun. I've got to get drinking! How fun are those?!! Very cool! Thanks for sharing your graphics with us! I knew I should have been saving bottle caps all this time! These are so fun and clever! Great job! I wish I had saved all our beer caps now! I guess we just have to drink a lot this weekend! So adorable. Wondering how else to use them! Love those graphics, thank you for sharing! I'm gonna have a big beer party this weekend to collect some caps!! I'm laughing that the majority's solution to their lack of supplies is: GOTTA DRINK MORE BEER! Ha ha ha ha haaa! Thanks for sharing! I love this! I'm so glad I have many beer drinking friends. It's the only time I've ever wanted to be a beer drinker! Those are so cute! I'll have to make some soon! Love these! Thanks for sharing! These are awesome! Oh, and I'm coming to Grandma G's beer party. These are so, so, so SO stinking cute! i am totally making these to give away at the next blog event I go to. I hope you don't mind. And I'll be sure to mention the idea came from you! Thanks, I just love your blog and all your ideas. Oh these are adorable. Thanks for the graphics - I love these! Awesome! Can I have them in full size format (say 8x10 ish) so I can have a real clock in my vintage trailer??? I love the 'rainbow' clock one best because it goes with my Blue/Green Calliope Amusement Park curtains. These are great. Now I need to start buying drinks with caps so I can build up a stash. Cheers for another great craft. Fantastic!!! I love these bottle caps!!! Ooh, the best thing to a Nelson clock! oh, i have been thinking about doing this with the hundreds of caps collecting in a basket atop the microwavebut had not sorted out exactly how, yay! thank you for the post! Very cool. I have a small collection of bottle caps that I've been keeping because because I knew there had to be a cool way to reuse them. Thanks for the idea. How did you ever think of this? Inspiring and so darn cute. Very nice. I love your graphics. thanks for sharing your graphics with us. I like it very much. I think I'm going to make these bottle caps to use them as embellishments in my scrapbooking pages. I have a lot of caps at home my younger sister used to play with them. Now I will have something to do with them. Thanks for the inspiration. So cute! I loved the graphics... ans a project that requires bottle caps? Perfect for Memorial Day weekend! Loved reading about these yesterday on your blog, and now they've just popped into my Facebook homepage, courtesy of CRAFT magazine! You're getting some good press. Nice to see; you do such beautiful work. making rootbeer floats tonight for the fam, plenty of bottle caps to use for this craft! awesome, RB floats and crafting!!!! Ah ha! Somebody who's not planning to drink gallons of beer to get bottle caps. I found the first several commenters to be very hilarious. Mom, I want you to have a beer party. I would like to see that. And if MP Amy is coming, I'm coming too. What a great idea! Thanks so much for sharing your graphics! so cute! what a great idea! Y'never know what I might do in my old age, Jess!! I have a couple of bowls full of bottle caps. What a nifty project. Thanks Jess! Yes! I've been collecting bottle caps for years this finally gives me some inspiration to do something with them! Love these! I'm gonna make these for a friend--she will FLIP! Thanks! PS. Saw this over at Whorange--just book marked you too! I love blogland! These are really cool! What photoshop program do you use? Aww, no way! These are fabulous! Thanks so much for the great idea. I'll be linking. You couldn't have posted these at a better time (time! ha, didn't intend that) because my 8-yr old daughter is practicing telling time on a "REAL" clock. She's having a little trouble with anything after the 30 minute mark. Darn tricky hour hand! ;) She and her friends love bottle caps, so this might be a fun project to do with them! Great timing! I've got the caps and the magnets and have been looking for something cool to do with them... thanks for the awesome graphics too! Wow, these are fantastic! Thanks so much for the graphics. What sort of printer do you use? I find that mod podge smears anything I try to print and use. I printed these on a color laser printer at a copy shop. The graphics were made in Adobe Illustrator. Instead of cutting all of your graphics by hand, try a 1" circle punch. Love these!!! what a great idea! Hey all - here's an idea. My father-in-law is member at country club, so he just asked the bartender lady to save beer caps for me. She saved a TON in a short amount of time. I just picked through and recycled the ones that were too bent to use, but I got many different caps this way. You could ask a local bar - they'd probably save them for you. Muchas gracias! They are so beautiful!!! I'm loving these. What program did you use to generate the graphics? Jenny, I used Adobe Illustrator. super cute idea. great graphics. These are awesome! What a fantastic and simple idea. Love it!!! I am constantly amazed at the wonderful creativity that people come up with! Thanks for sharing this one. The last time I up-cycled bottle caps was 10 years ago for my Brownie troop, turning them into mini rice bowls for International Day. Keep the creative juices flowing! it would also be really cute to flip them over, put your graphic inside, coat with Mod Podge dimensional magic and stick the magnet to the back. then you wouldn't have the magnet-thickness problem. Darling! By the way, I think it is simply lovely you are sharing graphics with everyone. thank you so much for the free printables. I'd love to invite you to apply the The Craft Map. Wanted you to know I posted a link to this tutorial on my blog today. I printed these off the day that you posted them. I have had the paper laying in sight since then, but we moved so there was little time, AND I had no bottle caps. Now, every party I go to, I ask friends to save their bottle caps and I've started to make some! It is so fun and easy, so THANK YOU for the free printout! I will be posting pictures on my blog ASAP. Made 'em, love 'em, and blogged about you as a result! Thanks so much. Here's the link to my poat about them! Thanks for the free printout! I love these! I just made some and glued them together using a glue gun, but the magnet tends to want to stay on the fridge and not on the bottlecap if I move it. Any suggestions for better gluing adhesiveness? I think I used E6000 glue. Good stuff. My magnets are super strong but they still adhere to the bottle cap when I pull them off the fridge. Thank you so much for sharing this. I have been looking for something my DS can do with his grandma... I think they will both enjoy this. I zoomed the pitures, printed and modpodged/ varnished them on the coasters. They turned out so great that I cann't stop looking them each time I go next to my coffee table. They are great "conversation beginners" too. Great graphiques, I like them a lot! I was looking for them long time. Thank you so much for providing the download file. I've been saving caps for this type of project and unsuccessfully looking for the right stickers to use. Could you buy scrapbook paper and mod podge that to the caps? My friend is wanting owl magnets and I found cute owl scrapbook paper. 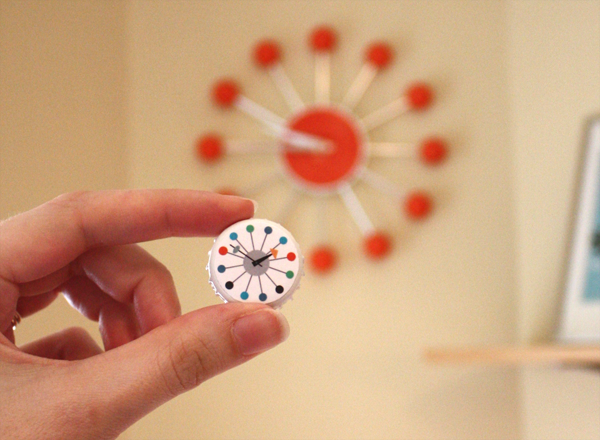 the used bottle caps accumulating in a cup in our kitchen: DIY mid century modern clock magnets. Someone asked for other idea using bottle caps - make the magnets but put letters of the alphabet on them. They make great learning tools for the younger kids while you are in the kitchen. The magnets will stick to the fridge and the kids can learn to spell and leave messages with the words they assemble. What a great idea! I love your images. Since I don't drink beer and don't know anyone who does, where would I get the bottle caps? Root beer, Coke, Izze sparkling juice, or lots of other sodas come in bottles. a lot of beer caps come in color, so no spray painting required.